I am listening to C.S. Lewis’ God in the Dock this week and last, and I have to say that his essay “Religion without Dogma?” in the first section is fantastic. His apologetics at their finest. He gently but relentlessly tears to shreds an essay called “The Grounds of Modern Agnosticism” by Professor Price (whoever that is). People who have never read any C.S. Lewis could read it as miniature representative of his apologetic approach as a whole, as in in books like Miracles and The Problem of Pain; those who are like myself Lewis fanatics like me will still find that it makes some unique points (or at least points I don’t recall him making in his books). Is there anybody out there like C.S. Lewis? What a combination of humility, literary skill, and spiritual insight, all jammed into one person. How would you compare Ravi Zacharias to C.S. Lewis in those categories you mentioned? I think Ravi is great! He does great apologetics work, and can really hold an audience spell-bound. HI Gavin – are you still listening to replies? This volume contains the proceedings of the Socratic Club 1942 – 1952. 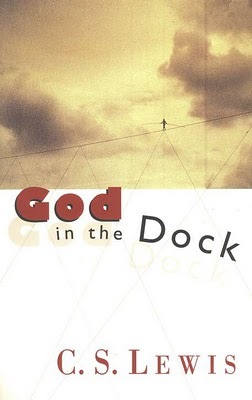 I am reading God In The Dock currently and I find it to be one of the greatest of all the compilations of Lewis’ work. I have often thought that if I could spend one afternoon with someone who has gone on, it would be Lewis. I am reading God In The Dock currently and am finding it to be one of the best compilations of Lewis’ work I have read. Particularly this article and The Trouble with X are excellent.